Graceful Losers on Our Side Don’t Get What We’re Up Against! RUSH: You know, it's hard to isolate one problem that we have. You have to rank 'em, and it depends on the perspective that you want to use determining what gets ranked where. But I'm gonna tell you something, folks. One of the biggest problems that we as conservatives have was on full display all weekend long, continuing into this morning -- and that is, quite simply, we have a lot of people who would rather lose gracefully with the approval of the mainstream media than simply use their heads and understand who our opposition is. Liberals, leftists, socialists, communists. And take the knowledge of who these people are and how they do what they do and what they do and simply reject it! Starting with the media, starting with the cable news networks, starting with the New York Times, starting with all the left-wing activists! But noooo! Oh, no! We can't even take a moment to reflect. When we see a picture of a teenager who's white wearing a Trump hat, a "Make America Great Again" hat, and he's standing there smiling while some aging Indian leftist activist is beating a war drum, what do we do? We immediately condemn the kid, without even thinking! Without even learning anything, without even taking a few minutes to understand what happened! Instead of using our instincts! "Okay, we got a left-wing Indian activist there. We've got the media jumping all over it." The red flags should have gone up immediately, and everybody on our side should have called 'em out for what this was! But instead, we had people on the right condemning the kids. And why? Why does this happen? They will tell you, "Because we must be honest and we must be filled with integrity." BS! These people are scared to death of the media and the first and only thing they care about is media approval. They don't want to be lumped in with the kids! So you have a bunch of kids from a Catholic high school standing around minding their own business, being assaulted by a militant, leftist black group and then having an Indian group with an aging leftist Indian activist named Nathan Phillips come start batting on his war drum. And the assumption is the kids, because they're wearing Trump hats and because they're white, must have provoked the whole thing. And so you dump on 'em so that your friends in the media in Washington will realize you're not one of these Trump-loving stupid little kid supporters. That's the only reason that you don't even take a period of five minutes to try to figure out what happened. Nope! You've gotta jump in without thinking a thing, without using what you know -- and this may be the problem. Maybe the people on our side that I'm talking about still do not know what liberalism is and who liberals are and what their game plan is and what their tactics are! After all of these years, after all of this instruction by me, after all of this guidance they still don't get it? The first reaction is to assume that the people traditionally on their side are guilty, because of what? A kid smiling wearing a Trump hat? 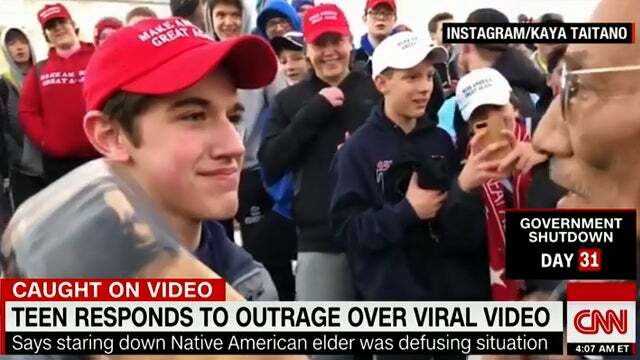 That still shot of the kid smiling automatically became a smart-aleck, jerk teenager disrespecting an elderly Indian -- wonderful, at-one-with-nature supporter? That's the first reaction people on our side had? It is, in many cases, and then after a number of days -- or, I'm sorry, hours -- go by and the truth is finally, once again, explained... This comes after this crap with BuzzFeed! This happens after our side got taken by that BS story from BuzzFeed that the special counsel had to come out and debunk. Notice they took all day to do that, letting that story sink in before they debunked it. So after accepting that, after accepting that Trump told The Rat to lie to Congress and to the special counsel about a Trump meeting, about a deal in Moscow, after accepting -- with no evidence. Anonymous sources. And the media, there's a new technique that they're employing to allow them to report these lies: "If true..." All these stories say, "If this is true, then this is bad. If this is true, it's the end of Trump." "If this is true" used to be the basis on which it was printed! "If this is true" used to be the basis on which stuff gets published or not. "If this is true"? I'm telling you, this hatred that the people on the left have for everybody... It's not just Trump, and it's not just Trump supporters. This hatred that they have has literally poisoned them, and it is poisoning our country, and it is destroying our society and our culture. The only innocent people on Saturday morning in Washington were the kids from Covington who end up being blasphemed and impugned and destroyed all over America! And they're the total, full-fledged innocent ones! They didn't do anything! Except show up at a rally for life wearing their "Make America Great Again" hats. They're from a Catholic school; so they had everything going against them. They're white, they're teenagers, they're wearing Trump hats, and they are Catholics. They believe in Jesus Christ. They have to be destroyed. So after everybody gets fooled (because they wanted to be fooled) by the BuzzFeed story. Then this thing happens on Saturday and the same people -- less than 12 hours after learning how they were scammed -- allow themselves to get scammed again. Our old buddies at National Review were among the first to pile on these kids. What would make a bunch of people on our side want to destroy teenagers? I'll tell you what would make them want to destroy teenagers: Salvaging their own reputations. They couldn't afford, in their own thinking, to be seen as being on the same side as these evil kids. Well, the kids were not evil! The black Israelites starting all this were evil, and then these Indian provocateurs -- who do this for a living because they're part of the bought-and-paid-for rent-a-mob of the American left. They join the proceedings because they know they have protected status in the media and within the Democrat Party. And right there: National Review, they start condemning these kids. I even heard Meghan McCain starting condemn these kids. All these people. National Review has erased, they've deleted their original story on this, whoever wrote it. Meghan McCain tweeted, "Oh, I'm sorry. Oh, my God. I should have waited. I should have spend some time." Everybody on our side says, "Oh, we're terribly sorry." Yeah, I get it. What I don't get is why you don't recognize these scams the moment they happen? I do, and it's not because I'm knee-jerk, and it's not because I'm prejudiced or bigoted. It's because I'm informed and educated on the left and who they are, how they operate, what their objectives are, what they think of us, what their game plan is. It isn't hard to do. The BuzzFeed story alone should have blown up that town. There ought not be anybody in the mainstream media who has any credibility with anybody going forward, and that could be true before the BuzzFeed story hit. These people haven't reported anything true about Donald Trump and Russia for two years. They've been making it up as they go. There isn't a story. They are ignoring the real story of the Hillary Clinton bought-and-paid-for opposition research. I'm on my way to the meeting on Friday that I had to miss this program for. I have the radio on in my car, and I hear two things that just make me livid. One of them is -- and, of course, I knew this -- Kim Strassel's column in the Wall Street Journal acknowledges that Bruce Ohr in the FBI office, whose wife was Nellie Ohr -- or maybe still is. She has the connections to Glenn Simpson and Fusion GPS. It turns out that what Devin Nunes told us all along actually happened, that Bruce Ohr told Comey and McCabe and the special counsel's office everybody knew that the Steele dossier was Hillary Clinton opposition research. They knew it! They were not fooled by it! Glenn Simpson didn't pull a fast one on 'em. Fusion GPS didn't pull a fast one. They all knew that the Steele dossier was bought and paid for by Hillary, and they still used it to go get FISA warrants to spy on the Trump campaign via Carter Page! Mueller, all this time, has known it! It should have been the biggest news of the day. And then I hear that some analyst over on CNN -- some guy named Mudd, Phil Mudd. In fact, I know we've got this in the audio sound bites. Let me find this real quickly here. If somebody knows the number, shout it out. No. 9. Let me find the transcript. Yep. Here it is. This is Phil Mudd. This is Friday morning on CNN's New Day. The anchor here says, "Bill Barr, attorney general designate, just said that if the BuzzFeed story is true, the president is a criminal. I don't think there's any other way to interpret that exchange." MUDD: Let me give you one angle here that nobody's talking about about that Barr exchange, and that is when Jeff Sessions was there, the president could claim there's one guy, Mueller, with a bunch of random Democrats running the investigation. This is a Comey moment. You fire Comey; you get Mueller. You dump Sessions -- because Sessions isn't involved in the investigation, you can't say my nominee is overseeing the investigation -- you get Barr, who just basically said, "When I see this stuff, I'm gonna bring a hammer down." I'm gonna tell you, Barr will be one of the most significant appointees the president has ever made because Barr, I suspect, is gonna crush the administration. The president is gonna say, "I never saw that one coming." RUSH: All right. So this guy is saying that Bill Barr is a stealth nominee, that Bill Barr fooled Trump, that Trump didn't know who his nominee is. (summarized) "This is the guy that's gonna nail Trump. This is the guy that's gonna bring us home. 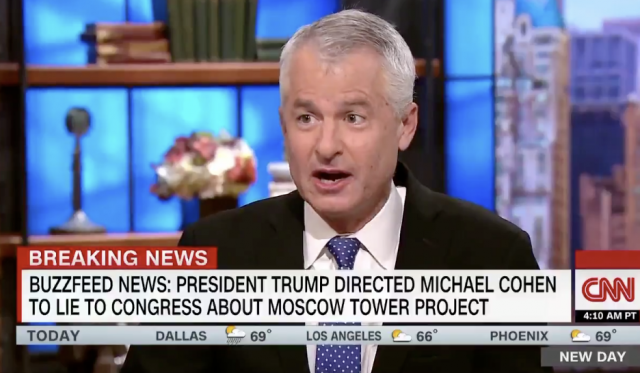 This is the guy that's gonna make all of us at NBC, at CNN, and MSNBC finally stand up and cheer and give us what we wanted for two years -- something that does not exist: Trump guilt in collusion with Russia. Bill Barr is gonna do it." And I'm listening to this, and it's all based on the BuzzFeed story which I know is BS! I know it! Even though I don't know it. I know it! BuzzFeed originally published the dossier. The guy that wrote the BuzzFeed story also wrote a story that Karl Rove had been indicted during the Scooter Libby days. This guy is a snake! He's a former coke addict. This guy is an absolute... Jason Leopold is his name. They're all snakes, and you can't trust anything that they do. So we've known that everybody that has anything to do with this investigation into Trump has known that the dossier is Hillary Clinton opposition research, and they still used it at the FISA court and treated it as legitimate intelligence. This whole thing is a fraud from before it began. It is an ongoing fraud, a hoax, a coup, whatever you want to call it. The BuzzFeed people are obviously leaking to select media people. I believe, looking back at the record, Amy Klobuchar, senator from Minnesota, questioning Barr, "If it's discovered, Mr. Barr, that the president of the United States has lied or instructed people to lie, will you hold him accountable?" What the hell? Where did that question come from? I'm convinced BuzzFeed called her up and a bunch of other senators on the committee and gave them a heads-up of their story that was coming the next day. None of it -- not a syllable of it -- is true! And the piece de resistance is that even though the special counsel, after all day debunking this, BuzzFeed says they stand by the story, which is allowing others in the media to continue to report it as a possibility. "Oh, yeah, BuzzFeed stands by the story." None of this would have gotten anywhere near as far along as it has if we had any winners on our side rather than graceful losers. We were willing to gracefully lose the election. These people, some on our side, have admitted they voted for Hillary Clinton rather than Trump. We will gladly be graceful losers so as to maintain the respect of the Washington establishment led by the Drive-By Media. We will throw kids, future Republicans, people that we ought to be encouraging -- we'll throw 'em overboard in a matter of seconds -- on the strength of one still shot photo on CNN! That shows a kid smiling -- I'm sorry, smirking and acting arrogant -- to an aging, weakened, Indian activist named Nathan Phillips. This guy has been an Indian activist, a left-wing agitator. I'm gonna give you details of some of what this guy did back in 2015. This is typical behavior for his group. But, for crying out loud! I mean, the left is who they are, and we know they're gonna do what they do! As in these two stories. The fact that we've got people on our side that cannot wait to pile on, cannot wait to jump in. All it would have taken was a half hour on the kid story. It wouldn't even have taken that. There should have been immediate suspicion based on what was being reported and by whom! Especially the day after the BuzzFeed fiasco? I'm gonna take a break here, folks. I think I better check my heart rate and whether or not I'm still in sinus rhythm. 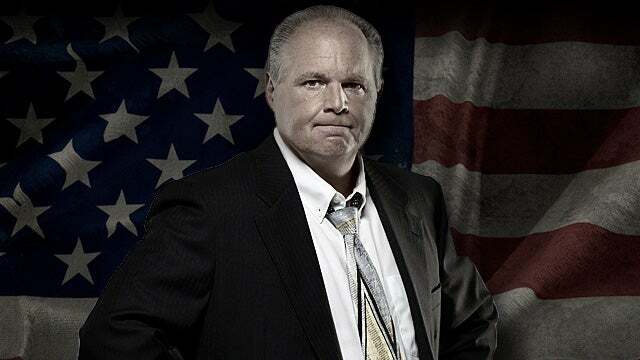 RUSH: So the media spends the whole weekend rubbing their hands together. Oh, they're so sorry about the damage done to their industry (sobbing), and they have all these panel discussions assembled. "What does the media need to do? What did the media do wrong?" How about just going out of business and saving the country a lot of grief? For cryin' out loud! This is so, so outrageous. After lamenting the damage done to their business by rushing to judgment on the BuzzFeed story, they spend the next day doing it all over again, trying to trash a bunch of teenagers that didn't do anything. Because it fits their narrative, that young, white, smiling, Christian men -- teenagers wearing Trump hats -- are evil incarnate, and that everybody around them is their victim. Everybody around them is as clean and pure as the wind-driven snow. So while they are lamenting the damage they did to their business, they do it all over again. Now today, they can't get enough of Kamala Harris announcing her candidacy for the Democrat presidential nomination. There's now about 50 of the 'em, whatever it is -- 20, 30, 40, 50. You know what? I don't care! I don't care if Kamala Harris has announced. I don't care if she gets the nomination. There's not a one of them that better ever end up in the Oval Office. But I, frankly, am uninterested right now who the Democrats nominate. I don't care about their race. I don't care about their primaries, other than the entertainment value that it's sure to present. But it ain't news to me that Kamala Harris has announced her candidacy. I just... It is mind-boggling to watch all this. I'll tell you something else. The threads on social media attacking these Covington kids? That is a cesspool out there, and it's become prime source material for journalists because they are lazy! They don't have to go report anything anymore. Just go to Twitter and get the most outrageous reaction and call it legitimate! "I am calling for a total and complete shutdown of teenagers wearing hats until we can figure out what is going on. They seem to be poisoning young minds." Later, when the truth was discovered, Congressman Yarmuth said (paraphrased), I was just joking. Ha-ha. I was just joking. "I am calling for a total and complete shutdown of teenagers wearing MAGA hats until we can figure out what is going on. They seem to be poisoning young minds. " 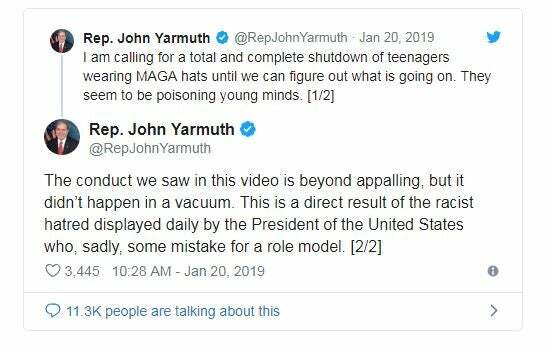 Nope, Congressman Yarmuth. It is the mainstream media poisoning America. It is the Democrat Party destroying and poisoning America. Sir, do you understand the assault on the First Amendment your stupid resolution is, "a total and complete shut down of teenagers wearing MAGA hats"? John Yarmuth. He's typical. He's not an outlier. He's typical of what has become of the Democrat Party. 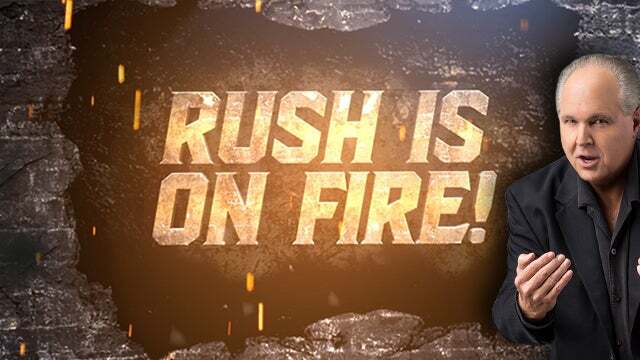 RUSH: I'm still not through unloading on all the rest of this stuff. One of the Drive-By Media outlets that really roasted these kids from Covington was at The Atlantic, and a writer at The Atlantic has published a piece, "I Failed the Covington Catholic Test -- Next time there’s a viral story, I’ll wait for more facts to emerge." Julie Irwin Zimmerman. "Like many people who spend too much time on Twitter, I watched with indignation Saturday morning as stories began appearing about a confrontation near the Lincoln Memorial between students from Covington Catholic High School and American Indians from the Indigenous Peoples March. "The story felt personal to me; I live a few miles..." Anyway, she retracts. She was one of the early pilers on, and she's begging forgiveness. She failed the test. She went along with what... Why does anybody in their right mind...? I know the temptation, but why isn't there even a moment's pause when anything from social media becomes source material in Drive-By Media? It is a cesspool, and everybody knows that it is a cesspool, because journalists have become lazy and don't actually do any real reporting. The agenda is the thing. The narrative, the soap opera script is the thing. So any time you can find confirmation of your narrative -- i.e., Trump is a bad guy; his supporters are a bunch of brain-dead bigots. Any time you find evidence of that (whether you found it or not), you go with it, and that's exactly what happened here. They followed the trends on social media and they all got suckered. But people on our side got sucked in by this as well. Here's another tweet. This is from somebody named Peter J. Hasson. I don't know Mr. Hasson. This tweet was sent to me by a PR guy for the Catholic Church. "Holy hell this thread," begins his tweet. 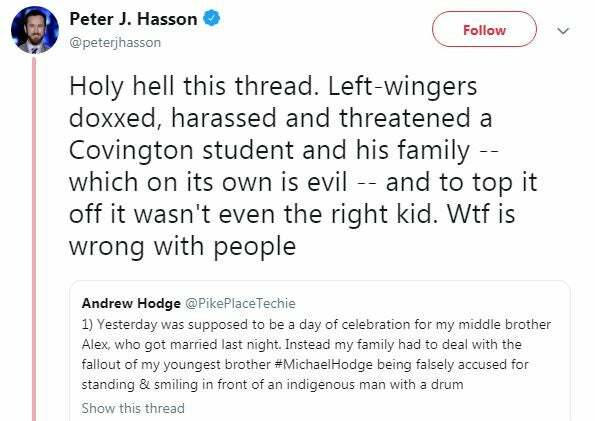 "Left-wingers doxxed, harassed and threatened a Covington student and his family -- which on its own is evil -- and to top it off it wasn't even the right kid. Wtf is wrong with people?" Why do we have to ask what is wrong with people when we're talking about liberals, when we're talking about militant activists on the left? What do you mean, what's wrong with them? They're doing exactly what they always do! There's nothing wrong with 'em except their existence! This is not a recent descent into insanity. This is... These people have been trending this way for decades! I mean, what is...? There's nothing wrong with them. This is what they do! The fact that it is not immediately rejected out of hand... "Well, Rush, we can't rush to judgement." Can't rush to judgment? It's exactly what you're doing by accepting this garbage! BuzzFeed story, this... Man, oh, man. Folks, here's a piece by Daniel McCarthy at Spectator.us: "What Makes a Liberal Want to Punch a Child? -- The progressive media doesn’t care about what really happened when it has white boys in caps to hate. If someone walks up to you and bangs a drum in your face, are you guilty of harassing the drummer? You might be if you’re white and wearing a MAGA hat. 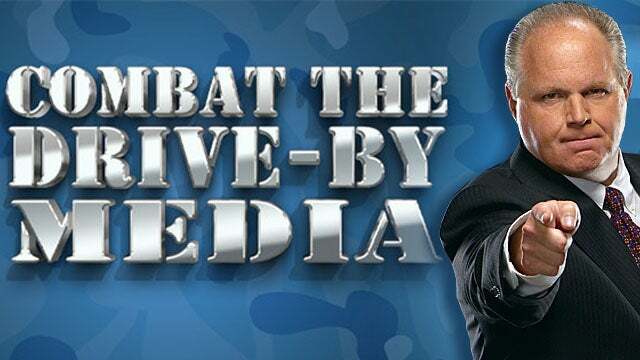 "Just a day after rushing to judgment about a BuzzFeed story that claimed President Trump had instructed Michael Cohen to lie to Congress — a story Robert Mueller’s own office subsequently debunked, the blue-checkmark media elite had a new instant narrative to promote. It was a tale perfectly tailored to liberal biases: white Catholic teenagers in MAGA hats had harassed an old and frail Indian veteran during the March for Life, which was also the date of an Indigenous People’s March." Okay, the March for Life, and there's the Women's March going on and then the black Israelis, Israelites, whoever they are, and then this Indian bunch. They all converge. Why? Because it's the right-to-life march! That's why they're all there, to disrupt that! The indigenous people... They're all showing up to create havoc for the right to life crowd, which everybody else ought to know as well. But the stories are written almost like the right-to-life crowd was there to disrupt everything -- the most peaceful bunch in the world. "BuzzFeed had just two anonymous sources, purportedly in ‘law-enforcement,’ for its story, which a few brave souls found to be rather too little to justify the attendant hype. The contrarians appear to have been right, but what BuzzFeed misreported was so perfectly attuned to elite and progressive anti-Trump sensibilities that no hesitation was necessary before accepting the tale as true. No lessons were learned," because less than 12 hours later, here comes the Catholic Covington story right on cue. This stuff is destroying the fabric of our society, and it's a laugh listening to people like F. Chuck Todd and others in the Drive-By Media try to defend it, try to defend the BuzzFeed story. 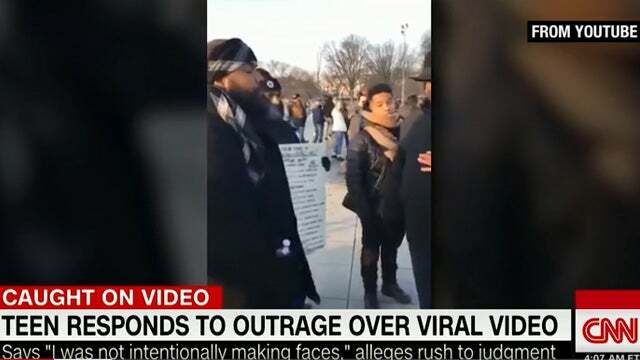 It was painful watching CNN try to hold on to the idea that the Covington kids actually were guilty, despite playing all of the video that shows they were the ones that were attacked, they were the ones who were approached, they were the ones who were not provoking anybody. (summarized) "Well, we haven't seen all the video yet," CNN said. "It's still possible these the kids did some things that agitated." It's still possible? There isn't any evidence of that! It's the exact opposite. In fact, the way things worked out, you had this black group, the Israelites. They've been around for I don't know how long. They believe weird stuff. They hate gays as well, by the way. Just throwing that in. Oh, speaking of which, I printed something. I can't wait to get to this later. It has nothing to do with anything we're talking about. It's a story in the U.K. Guardian about the end of comedy and why. I'm just gonna read passages of it. You will not believe this. You will not believe. This is an analytical piece on what's wrong. When you start talking about comedy instead of doing it, it ceases to be funny. The most boring thing you could do is talk about jokes, talk about comedy. You have a bunch of left-wing transgenders now trying to explain what's permitted and what isn't in comedy. Wait 'til you hear this. Anyway, you had this black group, and they were insulting these kids verbally, and they were intimidating 'em -- and it was vile, and it was vicious, and everybody has finally reported that. It was at that point that Nathan Phillips and his indigenous Indian group decided to stride over while pounding on his tom-tom. Oh, and CNN says the boys were doing "the tomahawk chop." No, they weren't -- and besides, the tomahawk chop happens in sports stadiums all over the country. But yet we were told that the tomahawk chop frightened and made the indigenous people wary and scared for their lives. (laughing) Give me a break! Anyway, it's entirely conceivable that the Covington kids thought the Indian was approaching them as allies to help, you know, join forces against this black bunch that was out just screaming vile stuff. 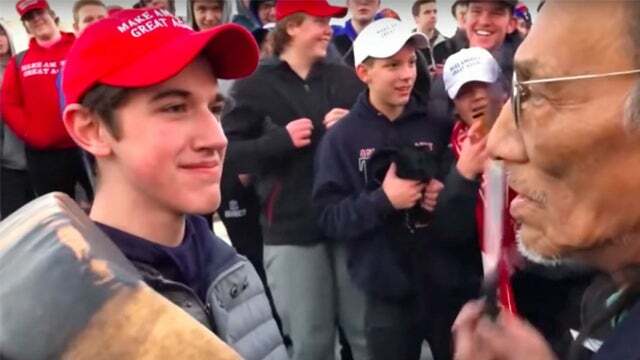 But instead what happened was, crafty old Nathan Phillips saw an opportunity to get in on this action, and he shows up to make it look like he, too, is protesting these kids by banging that ceremonial drum in this kid's face. And the kid has said, "Look, I made a decision to smile and not react. If I did anything else, the odds of it breaking down and falling apart would have been great." I'm paraphrasing what he said, but he said he made a studied decision to stand there and try to appear friendly to the frail old Indian Vietnam War vet pounding on his war drum. A still shot of that is what ended up being reported as arrogant, condescending, smirky, jerk white guys wearing Trump hats, intimidating frail Indian leader. Not a syllable of truth. RUSH: Let's get started on the phones here 'cause, folks, I am so wound up about this I could spend the next two hours talking about it and not repeat myself very much. Here is Westin in Philadelphia. Great to have you on the program. Hi. RUSH: No, no. Wait. I know what you're saying here, but that's not... I don't believe this is the race... This is the... What's the phrase that...? This is not the low expectations of minorities here that's in play. This is pure bias against Donald Trump and white Christian men. That's all this is. This is no more complicated. It's not about them being kids. It's not about the Indians and the black groups being minorities. This is about... This was seen for what it is not because of the bigotry and hatred of people on the left who cannot stand Donald Trump and who cannot stand the founding of this country as done by white Christians or white men of God. It's why it so ticks me off that people on our side did not see what this is! Except many of the people on our side hate Donald Trump, too! Not because he's white, but these people on the left, these kids just fit their jigsaw puzzle, fit their narrative, fit what they are trying to make reality to a T. Whether it was true or not didn't matter. This was instructive for everybody to see. Those kids, in other words, represent what must be overthrown, what must be gotten rid of as far as the left is concerned. I don't mean to be rude to you out there. I had to interrupt you 'cause of time 'cause I'm out of it now.